EMT/57074 Sergeant James Lynn M.M. James Lynn was the son of James and Elizabeth Lynn, of Coalisland, Co. Tyrone. James was born on 23 September 1882 in County Tyrone. The 1901 census shows 18 year old James as living with the family at Derry, Tullyniskane, Tyrone. His father was a railway porter. Elizabeth was a dress maker. 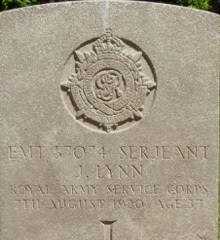 Sergeant James Lynn was serving with the 906th Company of the Royal Army Service Corps when he died in Haifa, Palestine on 7th August 1920, aged 37. The 906 Company, ASC, was formed in February 1917 and disbanded in June 1922 They served with Ismaila District in Egypt, as Corps Troops with the Desert Mounted Corps, and with North Force. Their role was 52 Auxiliary (Petrol) Company. 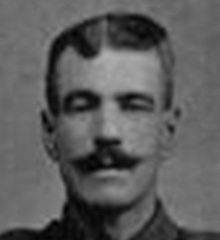 Sergeant James Lynn was one of four brothers who died on service; two are buried in Belgium, one in France and the fourth in Israel. 5 Haifa War Cemetery Discussion Grave photo and service details.